Intelligent story by Brian Clemens (easily the show's best writer as he created it in the 1st place) about how members of a public service can be corrupted by the power that they hold in this case the police of a small town who have cleaned up crime but feel there is more to do. Bodie and Doyle do some good undercover/spying work while Cowley gets to know the chief of the force in question. Best scenes are B and D trapping the homophobic cops in their makeshift office and Cowley confronting the police chief at the end ("IT'S MISTER COWLEY!"). 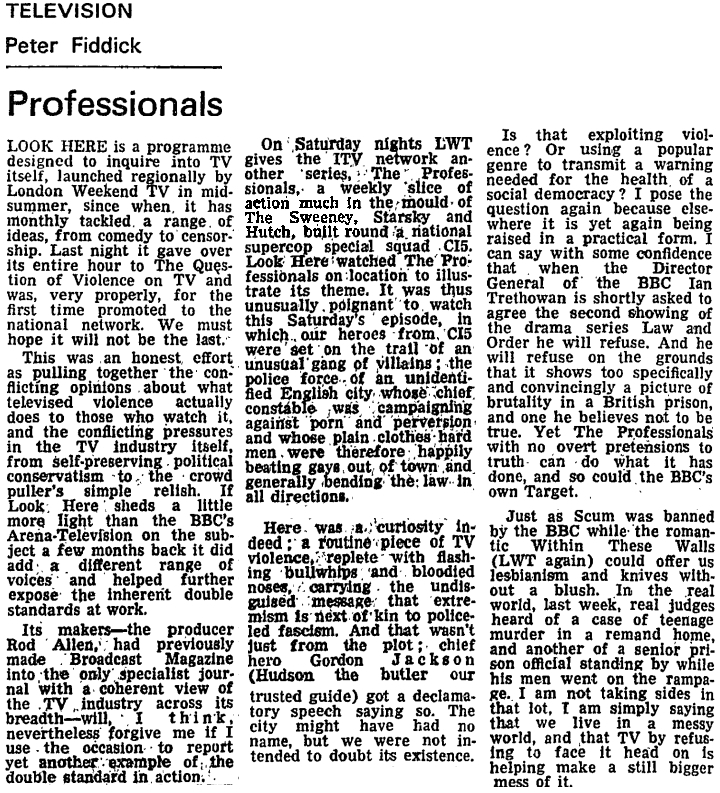 Very detailed critique there of TV's inability to tackle grittier adult themes of brutality and violence and for a change, Fiddick didn't give the Pros a slagging. Bit off topic, I know, but what I didn't realise from reading the article above was that the Professionals went out on a Saturday night. I always thought it was Fridays? It was Fridays to start with and then it moved to Saturdays. 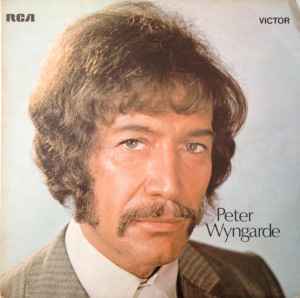 This is a favourite of mine, bent coppers and Bodie & Doyle up against it. Plus with John Judd and Stephen Rea thrown into the mix it is a superb episode I think. Great story! And it came from the pen of Brian Clemens. Just goes to show that he was the best writer on the series and not surprising as he created The Professionals! I wish he could have been allowed to write a few more episodes for the last 2 series, but Foxhole On The Roof and The Untouchables still showed his magic touch. Tom Georgeson was also one of the bent cops. He appeared as a good guy in Need To Know and would become a regular on Between The Lines which was about police corruption. I noticed this ep featured Welsh actor Fraser Cains. He always tended to play oddball characters. Near the start where we see Pellin follow Cowley back to his flat, we see Cowley enter Hurlingham Court through an entrance on Ranelagh Gardens (brown door). Pellin then enters Hurlingham Court through a different entrance on the Thames side of the building (black door) - you can see Fulham Railway Bridge reflected in the glass. Towards the end of the episode after Bodie & Doyle have given themselves up to the police and Inspector Chives arrives, one of the men holding Bodie looks like Tony Allen (Bill the Driver from The Sweeney). Watching The Professionals on Blu-Ray in production order makes this the third strong episode in a row. The Rack, Man Without A Past and now this. I know Brian Clemens created the series and he certainly understood it better than anyone else. Clemens was definetly the shows best writer. That Clemens would be the best writer of a show he created may seem obvious but that's not always the case with tv shows. Gene Rodenberry created Star Trek and also wrote some of the weakest episodes. He was certainly the best. The only one I was never keen on was The Untouchables, though I've not seen it in years. It’s an excellent episode and John Judd is very good as Insp. Chives. The story would have been very believable for the time. It is more thoughtful with slightly less action than usual but the story is so strong. I watched this one again the other day, still great stuff. One thing that struck me was why Cowley spent SO long with Chief Constable Green, was the whole day and a home visit really that necessary to prove the point that he had (essentially) 'lost it'? That said, some top acting on display here, Paul Hardwick as Chief Constable Green is great. I think Cowley was taking a "give him enough rope" approach with Green allowing him to hang himself essentially. I think Bodie & Doyle should probably have just 'called it in' too, meaning the last 10 minutes or so were pretty unnecessary. However, by not doing so, this gives the episode the extra punch at the end making it a classic. This is pure Clemens twist - love it. It is always great to see the good guys on the run (like in opening credits of 'Starsky & Hutch' or at the end of 'Magnum Force') and the end of this episode is great stuff all round. Was he sure people weren't asking for the herb? I never saw the screencard when I watched the episode last night in ITV4 also, but may not have been looking if being honest. I have seen them appear on other programmes from time to time. I have always enjoyed this one, has a menacing feel to it. I like the start where Cowley is being followed and then jumps out on Steven Rea's character. ALso just realised that this was a second appearance in the series for Tom Georgeson, an actor who usually pops up in most series, but after checking he didn't do either Sweeney or Minder. In this episode , we see the same police P6 Rover OOY986L , that appears in the first Minder episode , My Beautiful Launderette ! I'm sure the office scenes are shot on a street in Kentish Town off Prince of Wales Road. There are/were a few warehouses in the area as shown. Are there any location sites as in The Sweeney forum? I cannot remember seeing a Professionals location list on here, which is surprising, but the Dave Matthews site should be able to help. Bob Rocca's and Andrew Pixley's books give full location details of every episode.